* mpTrim can trim MP3s - removing silent or unwanted parts. * mpTrim can adjust the volume of MP3s. Volume change can be manual or automatic (volume normalization). 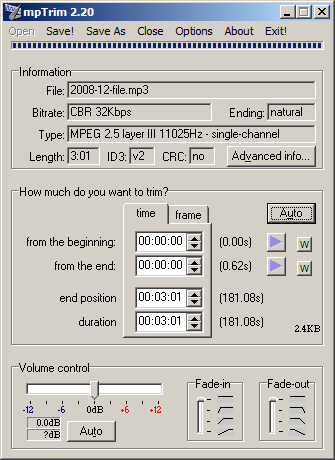 * mpTrim can fade-in/out MP3s (to fix abrupt beginning/ending). * mpTrim can clean-up MP3s and recover wasted disk space. * mpTrim keeps the music quality intact, no matter how many times you process an MP3, because it works directly in the MP3 format without having to decode/re-encode. That also makes it very fast. nice little app. i'm using it maybe 10 years already .